How was your weekend? It has been raining here for days and I could really use some sunshine! To start with, I’m trying to finish up an outdoor paint project for the final installment of the Outdoor Extravaganza. Second of all, my plants are water-logged. Frankly, my body and mind operate so much better when they’ve received a good dose of Vitamin D! How about you? Not all was lost. On Friday, one of my friends and I attended The Vintage Chicks sale (now known as Vintage with Flair). It was my first time going, and although it was difficult to navigate because of the crazy number of people, I was glad I did. I’m not one to decorate my whole home with vintage pieces, but I love adding something here and there to bring character to a room. 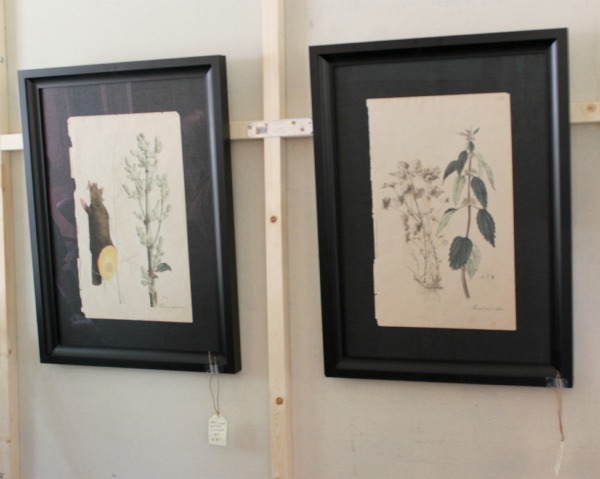 I was immediately drawn to these antique prints, but at over $300 a piece, I had to pass. 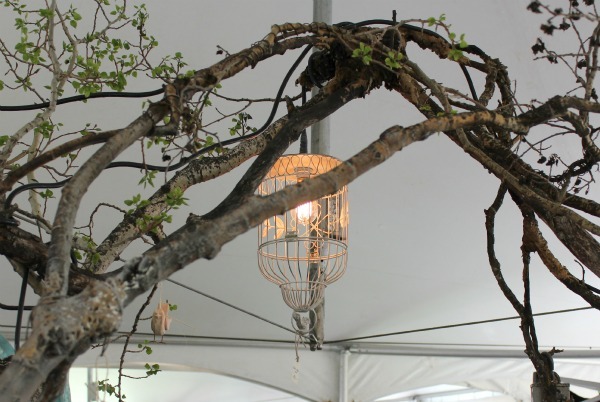 This birdcage chandelier hanging from a branch arbor was stunning. Imagine how beautiful this would be at an outdoor party. If we already had a cottage, I most likely would’ve picked up this red and white 7UP crate. 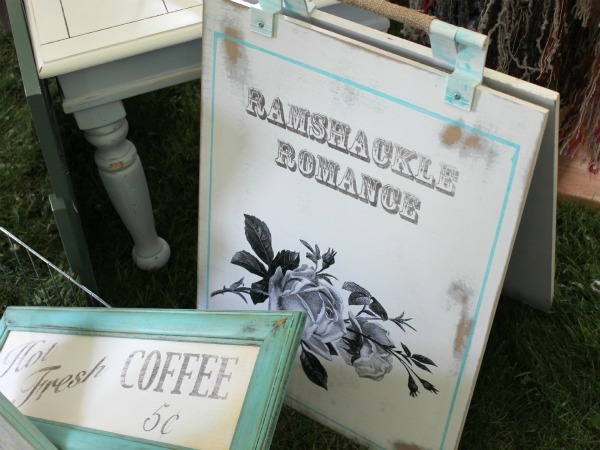 I loved the shabby chic look of Deborah’s (one of the vendors) sign. She also writes a blog called Ramshackle Romance. In this tent, we found 3 amazing antique dog prints and a bucket that my friend had to buy (basically for a song!). We made our way to the main building, where it was pretty much shoulder to shoulder shopping. It was pretty much impossible to take any photos- sorry! This is where I bought (you guessed it!) a milk glass bowl. I love finding new pieces to add to my collection. 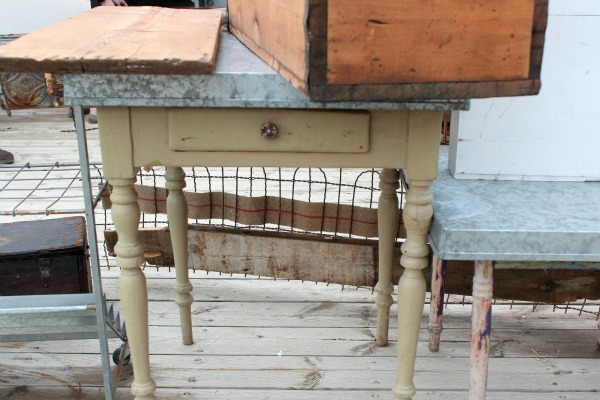 Our last stop was outside where I spotted these rustic tables. I was hoping the first one would be the right size to use as a side table for our basement family room, but it was too big- drats! This second one gave me an idea for an upcoming project- any guesses? Although I only went home with one milk glass bowl (and some kettle corn-of course! 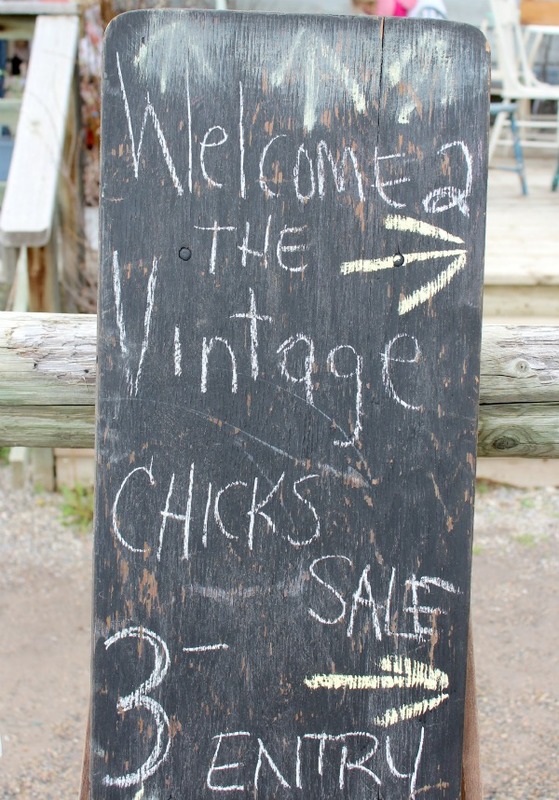 ), I had a great time at the Vintage Chicks sale and will be back next year. 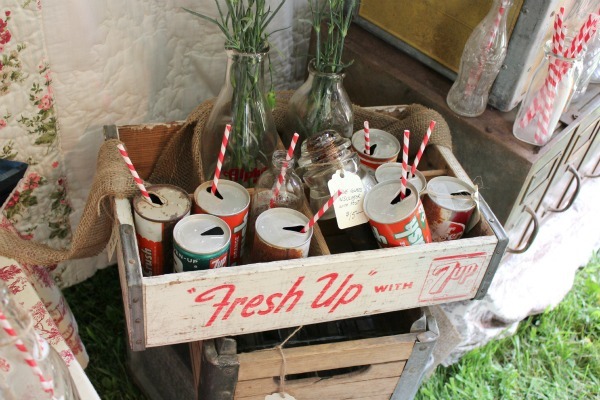 I love anything to do with thrift shops & vintage! Do you like shopping vintage? Are there any sales or markets you like to attend? 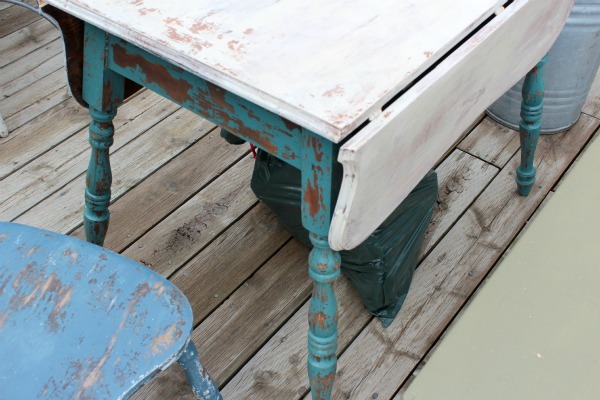 Don’t forget about your outdoor paint project for Wednesday’s link party! Thanks for the adventure, I can’t wait for more! It was a good time. Love those dog prints! Love that lantern…it would look great on my deck outside!! I went to the Kane County Flea Market this weekend. Came home with a few things and saw lots more! I found an antique European dough bowl that I THOUGHT I wanted until I realized they are PRICEY! The one I found was $100 but I soon found online they can run up to $300!?!?! Moving on….